Honda Motor Co., Ltd. today announced its decision to participate in the season 2015 world championship Formula 1 (F1) organized by the International Automobile Federation FIA * 1st In the championship enters into a joint project with the McLaren F1 Team based in the UK. Honda will be responsible for the development, manufacture and supply of power unit including motor and system for kinetic energy recovery. 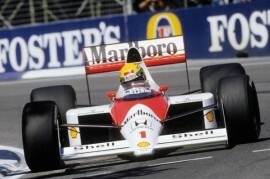 The task of McLaren will be the development and production of chassis and also lead a new team McLaren Honda. The new rules require F1 2014 introduction of 1.6 liters supercharged V6 engine with direct fuel injection equipped systems for the recovery of kinetic energy. Opportunity to further develop these technologies powertrain in a challenging environment of motor racing is the main reason for the decision by Honda to compete in F1 involved. Honda has throughout its history has always vigorously sought to increase the efficiency of internal combustion engines and in recent years, developing breakthrough technology for energy management, such as hybrid systems. Participation in F1 racing under the new rules, the development of technological advances in both of these areas further. Besides that, a new generation of Honda engineers the opportunity to gain experience in a challenging and exciting environment of high competition motorsport. Takanobu Ito, President and CEO of Honda Motor Co., Ltd., This crucial decision said: "Honda since its founding a company whose development relies on the efforts to solve technical issues that brings automotive competition. The company has a long history of involvement in a series of the most prestigious automobile races in the world that inspires our employees and allows for further development of our technology. New rules F1 races, which is heavily focused on environmental protection has become the impetus for more intensive work to improve our own modern technology and are the main reason for our participation in F1. The decision of the FIA * 1 to introduce these new rules gives us a deep respect. New regulations are in fact not only very difficult but also attractive for manufacturers who are developing technology environmentally friendly and a group of the Formula One Group * 2, which changed the category F1 race cars of the highest quality supported by enthusiastic fans. We would like to express sincere gratitude to Jean Todt, President of FIA * 1, and Mr. Bernie Ecclestone, CEO Formula One Group * Group 2, who for our participation in F1 racing had a great understanding and greatly contributed to its fulfillment. Honda's corporate slogan is "The Power of Dreams" (Power of Dreams). This slogan reflects our strong commitment to fulfill and realize our dreams together with our customers and fans. Honda in collaboration with McLaren, which is one of neuznávanějších F1 Constructors, entering a new phase of its work in F1 racing. " "Brands McLaren and Honda are inextricably linked to the success of Formula 1, and everyone who works for these companies know that our joint achievements in the past are very demanding challenge. This connection is a sign of ambition and commitment that we share: bring back the McLaren Honda at the top of success in Formula 1 Together we share a great link - and we are determined to meet him, "said Martin Whitmarsh, CEO of McLaren Group Limited. FIA president Jean Todt said: "I am very pleased that Honda has decided to resume cooperation with McLaren and in 2015 he returned to the Formula 1 World Putting new engines next year in the form of 6válcového engine capacity of 1.6-liter direct-injection and heat recovery system is very interesting challenge and outlines a vision for the future in motorsport. I am sure that Honda in the coming years will become a strong contender. " A Bernie Ecclestone, CEO of Formula One Group, says: "I am delighted that Honda returned to Formula 1 Its engine technology and a passion for motor sport makes it obvious participant competes Formula 1 "
* 2 The Formula One Group is the collective name for a group of companies within the organization that manages all the Formula 1 races, including Formula One Administration (FOA; Administration F1), whose responsibilities are business law, and Formula One Management (FOM; Leadership F1) which is in charge of promotional and marketing activities.